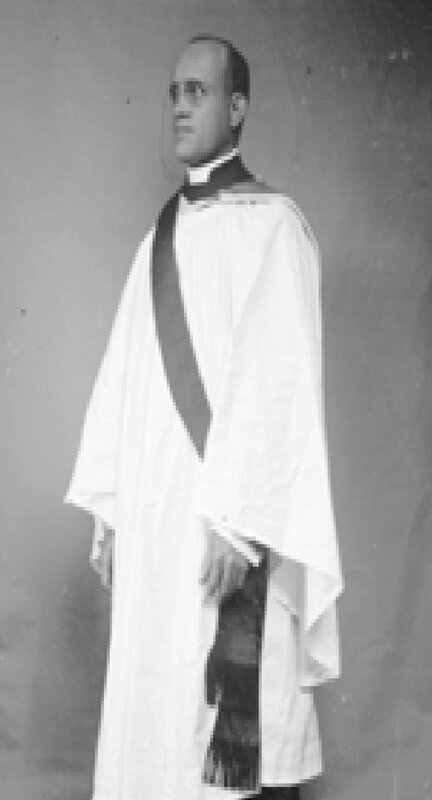 A fact that may be unknown to many is that East Kent had a Black priest; the Rev. James Arthur Harley, from Antigua, West Indies, serving the communities of Marshside and Deal from 1910 - 1913. Pamela Roberts, author of Black Oxford —The Untold Stories of Oxford University’s Black Scholars, came across the existence of James Arthur Harley through a chance remark, which eventually lead her to the tracing and locating of his personal archive. She is now researching and writing a historical biography about him. This is a brief overview about Rev. Harley and his time in East Kent. James Arthur Harley was an Antiguan child of two races - born thirty years after Emancipation to a white father and a Black mother; with a surname associated with British aristocracy. Harley arrived in America in 1899 on the cusp of the 20th Century to pursue two goals: an academic education and attendance at the General Theology Seminary to become a minister in the Pentecostal Episcopal Church. Harley navigated the complexities of white America’s overt racism; African-American prejudice towards him, as a colonial West Indian, and financial difficulties, to achieve his academic goal of acquiring an accomplished education. He attended Howard University, (1900 -1902), earning his Law degree in two years instead of the stipulated three years, spent a year at Yale,(1902-1903), before embarking on a AB degree in Semitic Languages at Harvard University, (1903 – 1906). A gifted scholar he was also awarded a number of prizes these included: the Pierre Jay prize and the Hill Prize for the best essay and the Bowdein prize for debating. Harley came to England in 1907and took a theology degree at Jesus College, Oxford University. In 1909 he made history as the first Black student to take the Anthropology Diploma at the Pitt Rivers Museum, Oxford, England. Harley married Josephine Lawson, an African-American member of Washington’s Black elite, a graduate of Oberlin College and a teacher at the renowned Cheyney Normal School, Pennsylvania from 1907 until 1908. The school, founded in 1837, developed from the ground breaking Institute for Coloured Youth, as the first institution to provide higher education for African-Americans. Her parents, both political and social activists, contributed to the early civil rights and education movement, with the establishment of the historic Frelinghuysen University in 1917. The couple married at Oxford Register Office on July 1st 1910. Rev. Harley secured his second curacy in the village of Marshside under the direction of Rev. Kent. Marshside was a very rural village; the couple would have stuck out like a flashing traffic signal. Harley did not portray the perceived image, and perhaps, the temperament and attitude expected of a rural parish curate. This was illustrated by the comments made in G.C. Pethring, the Bishop of Peterborough’s letter to the Rev Kent about Harley. ‘He is without doubt far and away above average curate in abilities and powers. He is proven in teaching. The people all like him and want him to stay’. ‘ At Chislet I painted the church with my own hands and collected enough to have it thoroughly furnished and restored. The people presented me with a silver tea service and a testimonial. The church is crowded when I preach, thanks to (1) to dear Old Eli and Mr. Fox, and (2) to Fair Harvard’. It is illuminating that during her time in England Josephine listed her occupation as homemaker in her college year book 1927. A professional teacher, her skills and expertise could have been utlised in the village school, situated in Chitty Lane, but one can only imagine the outcry and uproar there would have been. Probably more qualified than her English counterparts, and the village school teacher, a fleeting thought about the amazing resource that was available to them would not have even entered the minds of the school’s governing body; let alone entertained - it is hard to comprehend what would have been more detrimental: being a woman, being Black or an American. Rev. Harley was made a priest on June 11th 1911 at Canterbury Cathedral. According to Crockford’s Clerical Directory, Rev. Harley was a priest at St. Leonards Church, London Road, Deal, from 1911-1913. The couple resided, not in the curate’s house, adjacent to the vicarage, but it appears as lodgers at 1 Middle Road, Upper Deal. It is unclear exactly when Rev. Harley left the parish, as his name appeared as a visiting preacher on a number of The All Deal parish magazines dated September 1915 and 1916. A man of principle and social justice, Rev. Harley answered the call to arms; to serve the mother country in the Great War. Too old to enlist, undeterred, he served his country on the home front, training as a skilled toolmaker at the University of London, and worked in a munitions factory. Rev Harley and his wife’s time in Kent illustrate an unfamiliar narrative of the Black presence in Edwardian England. Rev Harley’s life story is one of determination, personal conviction, survival and ultimately triumph. Article by invitation from Alan Buckman. A free public lecture, as part of the Canterbury Festival, in association with Canterbury Christ Church University. Presented by Pamela Roberts, the lecture will provide a fascinating insight into the life of James Arthur Harley, and his wife, and their time spent in Kent. The talk explores how the complex intertwining of education, religion, politics and race in the early twentieth-century impacted and shaped Harley’s life and how this translated to his church career. Harley’s life illuminates an era often overlooked with regards to Black cultural heritage in Edwardian England. The lecture takes place on Wednesday 21st October 2015.